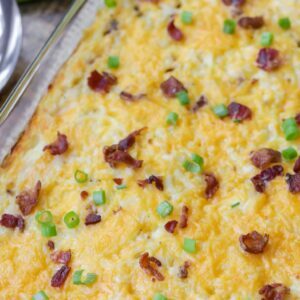 Easy Cheesy Hashbrown Casserole is the perfect side dish to any dinner or holiday meal. 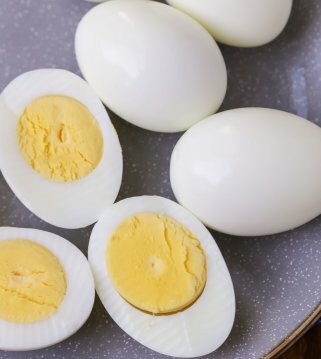 It takes just 5 minutes of prep work and is hearty and delicious! We’ve discussed our love of potatoes many a time here on Lil’ Luna. 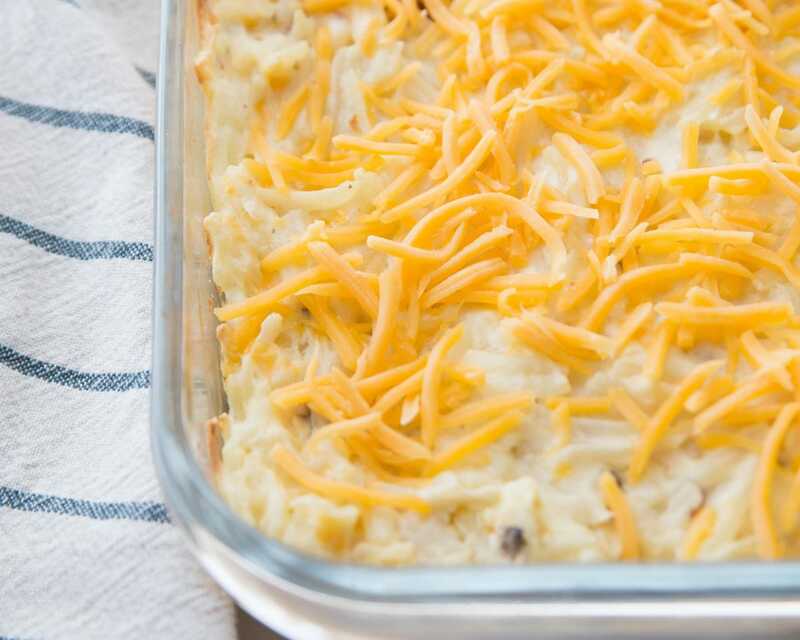 One of the best ways to enjoy them is in casserole form, and although we have plenty of potato casserole recipes here on the blog, today’s Cheesy Hashbrown Casserole is another favorite that is great as a side dish for any dinner or holiday. This hashbrown casserole reminds me of the Funeral Potatoes we’ve made for years and years but it’s even easier!! And best part is we usually have these ingredients on hand at all times. All you need are some hashbrowns, cream of chicken, sour cream, cheese, bacon and salt and pepper. This recipe is very simple. You literally mix everything together, dump it in a 9×13 and bake it!! You add some more cheese just before it’s done cooking, but I’m telling you – just FIVE (yes, 5!!) minutes of work. It does call for bacon, but you can just use pre-cooked bacon if you’re going for easy. We loved that it required little work and was so delicious too. 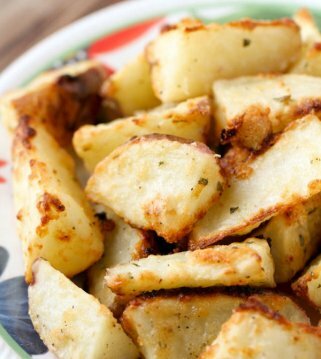 Can you use cubed hashbrowns for this recipe? Yes, you can – but you may need to cook it for a bit longer since the potatoes are more thick. Can you make hashbrown casserole ahead of time? Of course! We love that this side dish can be made up to 48 hours in advance. Just cover and store in the fridge until ready to bake. Add a few minutes to the cook time if the casserole is still cold. How to freeze hashbrown casserole? Wrap the dish in freezer wrap or foil and store in the freezer for up to 2 months. Thaw completely before baking. Bake in the oven at 350 until heated through. How to reheat hash brown casserole? Reheating your hash brown casserole is a cinch! Just preheat your oven to 375 degrees and reheat for 7-10 minutes or until it’s warmed through. Or you can reheat in the microwave until heat thoroughly. The time will vary depending on your microwave. 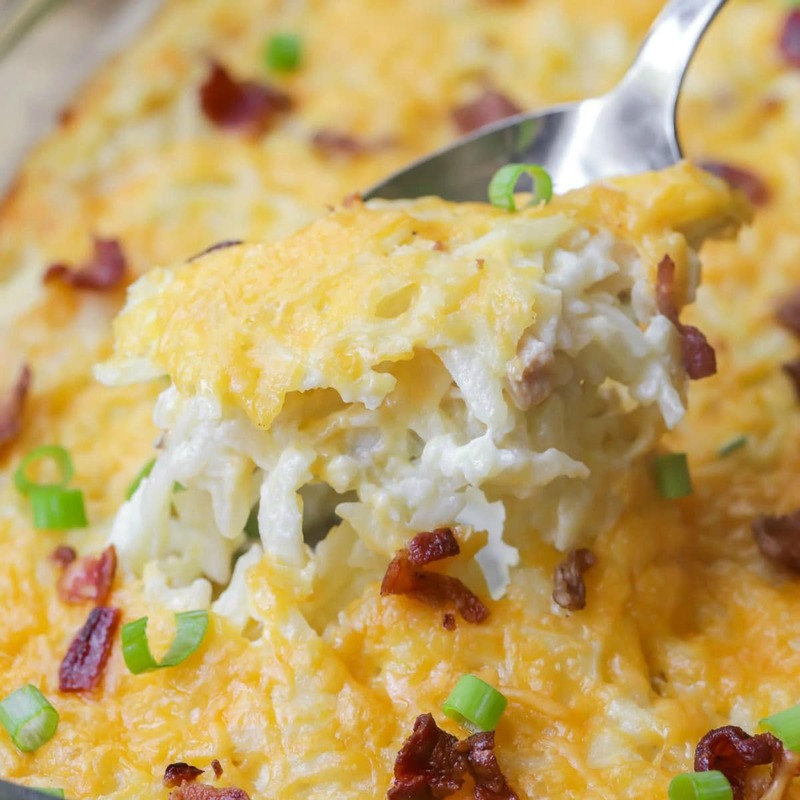 With sour cream, bacon, cheese and cream of chicken/mushroom, this hash brown dish is a hit with everyone! 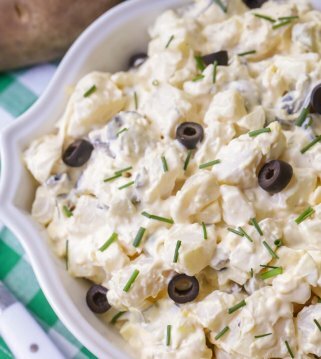 We always have potatoes as a side dish for Sunday meals and holiday dinners, so I’m glad we can use this recipe for those times, especially since everyone loves it. 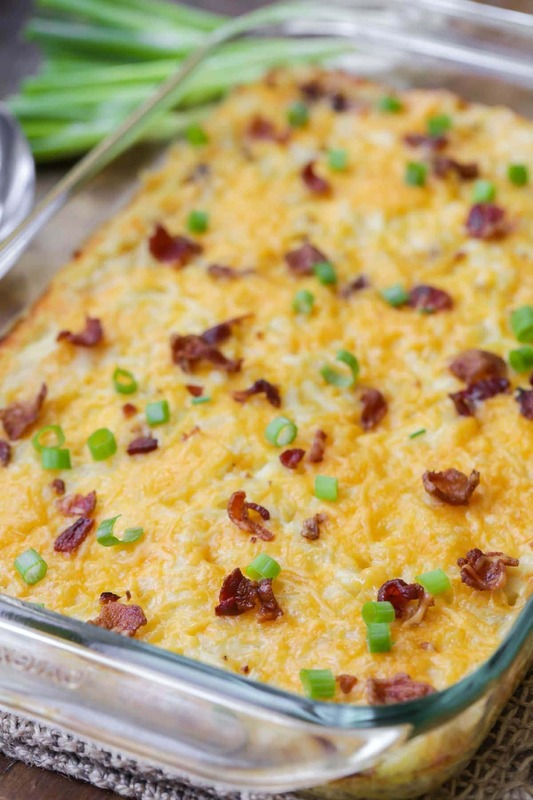 Cheesy Hashbrown Casserole - just 5 minutes to put together and then throw in the oven. 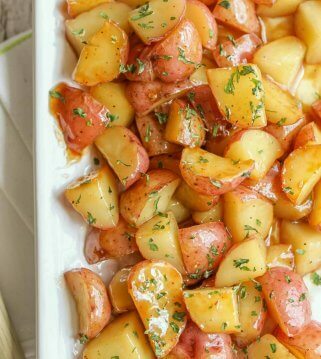 It's one of the best and easiest potato casserole recipes you'll ever try!! 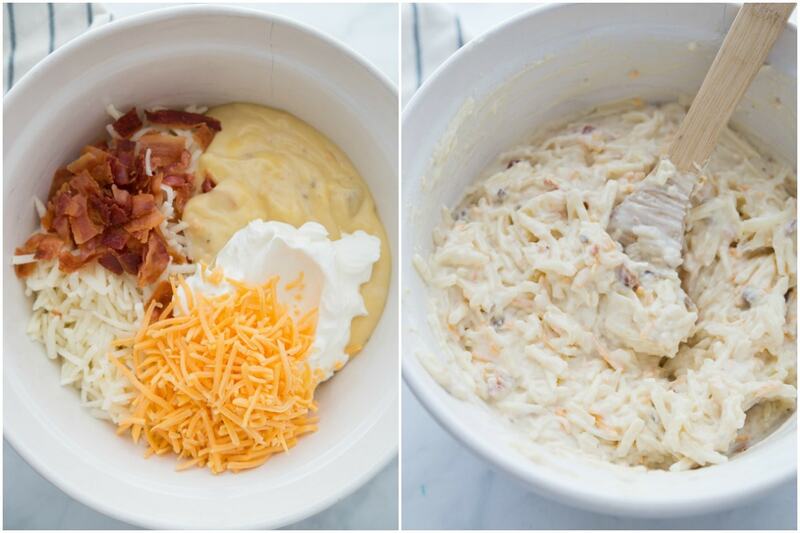 In a large bowl, combine hash browns, bacon, soup, sour cream, and 1 cup cheese. Mix until well combined and spoon into a greased 13x9 dish. Bake for 30 minutes. Take out and sprinkle on the last of the cheese and cook an additional 10 minutes. I can SO relate. Food, potatoes, carbs–they equal happiness!! This looks amazing! Love a good cheesy potato dish! Cheese AND bacon AND potatoes!! I’m on it. Gotta love one-dish meals! I bet this is a hit with everyone! I’ll take that whole pan please! This casserole is all things good in this world – YUM! It doesn’t get better than this for Thanksgiving! Found the right soup by the way! And made this last week — and this week both sets of missionaries, the Elders and the Sisters, commented on how much they loved the ‘funeral’ potatoes I made them last week!!! So thank you — again!! Hi Donna, is it two separate cans of soup or one can of cream of chicken with mushroom? It was one can of both!! Such a good combo. Make these – they are yum yum!! When I make cheesy hashbrown casserole I leave out the sour cream and add one packet of dry ranch dressing to it. My grandkids love it and ask for it everytime we have a holiday. Try it! Sounds good, I’ll have to try that! Thanks! This looks amazing! Cheese, bacon, and potatoes!! Love the cheesy potato dish and will try next weekend. You are one of those beautiful creators that is always full of great surprises. Thank you so very much for this one ! Made this one night with pancakes for dinner. Fabulous!! Thank you for giving it a try! It’s great with pancakes!